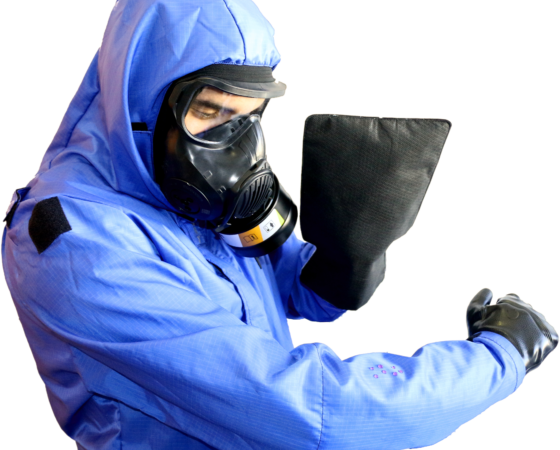 In the case of contamination by chemical warfare agents, acidic projections or industrial chemicals, it is imperative to have a decontamination process in place to quickly remove dangerous agents from the surface on which they have been dispersed. Immediate decontamination (military concept) or emergency decontamination (medical concept) is generally carried out in the form of dry decontamination by using an absorbent powder that moves the toxic agent from the surface. Fuller’s earth in the form of montmorillonite or smectite is the most widely used because it is easy to use and its spectrum of action is very wide. It is easily spread and eliminated by taking the toxic product with it. Fuller’s earth has therefore naturally served as a reference in our experiments. However, initially intended for use by soldiers equipped with PPE and masks, it can also be used to decontaminate civilians who are not equipped but with serious disadvantages: the re-aerosolization of potentially contaminated fine particles in the air can enter the lungs, mouth and ears of treated persons with secondary toxic effects. Moreover, since it has no effect on the toxicity of the product, it can contaminate the environment and cause secondary contamination. The Decpol® mitt developed by Ouvry is in the form of a super-absorbent glove containing active agents capable of destroying the product that has penetrated it. The drawbacks of the powder are therefore resolved since the suspicious liquid is immediately absorbed into the fibrous pad by capillary action and then destroyed inside the glove: no risk of re-aerosolization, and destruction of toxic agents. If it is not the intention to detail the experimental protocols here, we will mention the methods and the main results obtained. The chemicals used were HD and VX and the material coupons tested (5 x 5 cm) glass, painted stainless steel and fabric from Ouvry’s TFI® outfit. 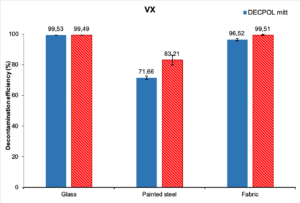 Contamination was carried out by 20 drops of 1 µL HD (10 g.m-2) or 25 drops of 1 µL VX (10 g.m-2). Five-minutes decontamination protocols were performed according to the recommendations of the Decpol® mitt and Fuller’s earth producers. We followed the NATO AEP 58 standard (STANAG 4653) for testing and STANAG 2352 for interpretation. Regarding the decontamination of mustard, the 2 systems are completely equivalent on glass and textiles with decontamination percentages of around 99%. Residual contamination is below the threshold imposed by the AEP-7 in both cases. As we can see, neither Fuller’s earth nor Decpol® can properly decontaminate painted stainless steel. It should be noted that the ordinary paint used here did not have the characteristics of a “decontaminable” paint now used for specialized equipment. 5 x 15 cm glass specimens were contaminated with 20 drops of 1 µL HD (10 g.m-2). After 5 minutes of exposure, the Decpol® mitt was used to wipe the deposit by a movement from the contaminated part to the clean part of the slides. After cutting the slides, HD was measured on the initially contaminated parts and the so-called “clean” parts. For an initial contamination of 9538.7 mg.m-2, the HD level was measured at 51.7 mg.m-2 on the “dirty” part, i.e. a decontamination factor of 99.46%. On the “clean” part the rate was < 1 mg.m-2. This implies that the toxic product has not been transferred to the clean part, resulting in no cross-contamination or transfer from the dirty area to a clean area. They are used to measure the amount of desorbed (released) toxic chemical from the immediate decontamination device. Fuller’s earth or Decpol® mitt was placed in a temperate cell. 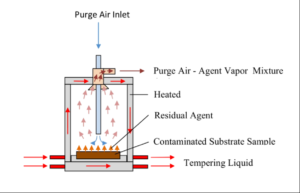 A mixture of nitrogen, hydrogen and compressed air was introduced and the residual gases escaping from the supports were measured by gas chromatography. The system also allows quantifying very precisely the degradation of the chemical product inside the support (Decpol® mitt or Fuller’s earth). The tests were carried out with GD because of its volatility. Fig 4. Residual quantity of GD inside the Decpol® support (in blue) or Fuller’s earth (in orange). 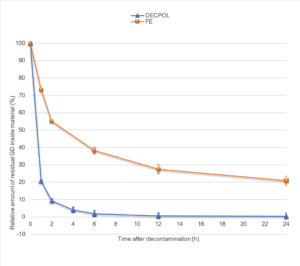 It can be seen on this graph that 2 hours after the contamination of the Decpol® glove, over 90% of GD was destroyed and that in 6 hours 95% of GD was degraded. After 24 hours the remaining percentage is very small. In the case of Fullers’earth, in 2 hours, only 45% of GD is inactivated and 62% in 6 hours. After 24 hours there is still more than 20% of toxic product left. To fix the ideas, a quick glance at the graph shows us that the activity of Decpol® on GD in 1 hour is equivalent to that of Fuller’s earth in one day! No active agent being included in Fuller’s earth, these are non-specific phenomena that are involved in the decrease in the quantity of GD. The Decpol® mitt has excellent transfer decontamination capabilities, quite equivalent to those of Fuller’s earth. In addition, it does not transfer toxic substances from a contaminated point to an uncontaminated point, thus avoiding cross-contamination. As it does not contain aerosolizable powder, it prevents the dispersion of the contaminant in the air and therefore the clogging of gas masks in a closed environment, and worse, the inhalation of contaminated particles by personnel not equipped with gas masks. Its neutralizing properties prevent dispersion of the product in the environment, however, the product must be considered and treated as contaminated waste after use, even if the risk of contamination in contact with it is extremely low. It can be reminded that this product can be used in both the military and civilian fields. This entry was posted in blog-en and tagged Chemical agent, Décontamination. Bookmark the permalink.